1. In a mixing bowl, beat together the eggs, white sugar, and brown sugar. Mix in the oil and vanilla. Fold in carrots and pineapple. 2. In a separate bowl, mix the flour, baking soda, salt, and cinnamon. Mix flour mixture into the carrot mixture until evenly moist. 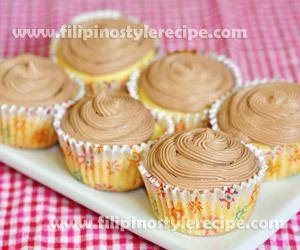 Fill the prepared cupcake cups to almost full. 3. Bake in preheated oven at 350 degrees Fahrenheit for 25-30 minutes. Remove from oven and let it cool before frosting. 4. 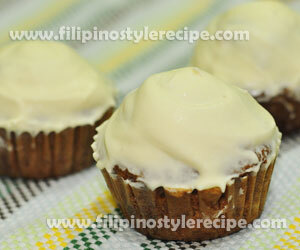 To prepare the frosting,in a medium bowl, cream together the cream cheese and butter until creamy. Mix in the vanilla and orange extract, then gradually stir in the confectioners’ sugar. 1. In a bowl, sift together the flour, baking powder, baking soda. 2. In a mixing bowl, beat together the sugar and butter until creamy. Add the eggs one at a time, beating lightly after each addition. Add the sour cream,milk, and vanilla extract and beat until combined. 3. Gradually add the flour mixture and mix using spatula until no dry lumps remain. Fold in the grated cheese. Do not over mix. 4. Put cupcake cups into muffin pan and pour batter into each cup until almost full, around 3/4 of the cup. 5. Bake in preheated oven at 350 degrees Fahrenheit for 15-20 minutes.Remove from oven and let it cool slightly before frosting. 1. In a bowl on top of a pan with boiling water, melt the chocolate chips.Let it cool. 2. In a mixing bowl, beat together the cream cheese and sugar until smooth. Slowly add the melted chocolate and beat again until well combined. 1. In a mixing bowl, combine the buttermilk, oil, eggs, and vanilla and mix until well combined. 2. In another bowl, sift together the flour,sugar, cocoa powder, baking soda, baking powder and salt. Slowly add dry ingredients into the wet ingredients and mix on low speed until well combined. Add the coffee and mix again until just combined. 3.Scoop the batter into muffin pan with cupcake liners until around 3/4 full. 5 minutes before completely removing from the pan. 5. To prepare the frosting, in a large mixing bowl, cream butter until fluffy, around 5 minutes. Slowly add in confectioners sugar and cocoa powder while continuously mixing. 6. Add vanilla and coffee and blend on low speed. Gradually add milk until you reach desired consistency. Beat at high speed until frosting is smooth and fluffy. 7. 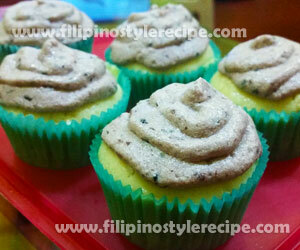 Frost cupcakes then serve. Enjoy. 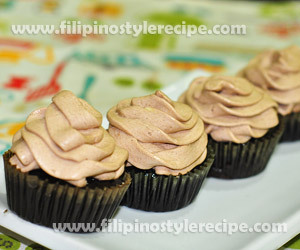 Filipino Style Recipe: I have received requests from my colleagues to do a pink cupcake so one lazy afternoon, I decided to grant their wish. The cupcakes came out beautifully and my colleagues raved about them. 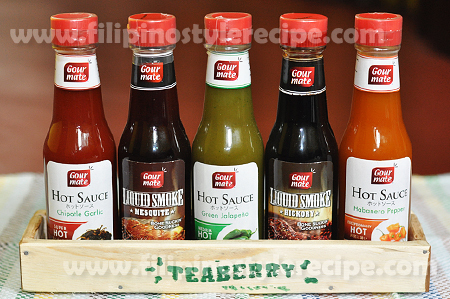 Now I am thinking what other flavors and colors will be next. 1. In a large mixing bowl, cream butter and sugar using an electric mixer until light and fluffy, around 5 minutes. Add eggs one at a time, beating after each addition until just combined. Beat in vanilla. 2. In another bowl, combine flour, salt, baking powder and baking soda. Add to the creamed mixture alternately with the sour cream, beating well after each addition. Mixture is a little heavy. 3. 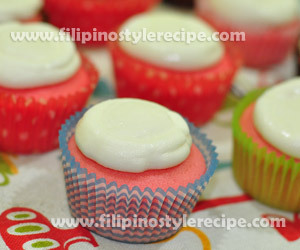 Add the food color and strawberry extract and whisk slowly until color is well distributed. Use more or less food color to achieve the shade of pink that you like. 4. Fill paper lined cupcake cups until 2/3 full. Bake in preheated oven at 350 degrees Fahrenheit for 15 minutes or until toothpick inserted comes out clean. 5. Get the cupcakes from the oven and quickly top with marshmallows. Put back in the oven and bake for 30-40 minutes until marshmallows are softened. Remove from the oven and press down the marshmallows using spoon. Let it cool completely. 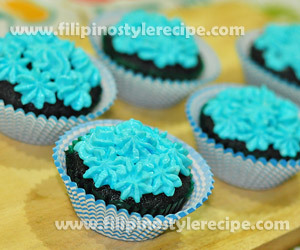 Filipino Style Recipe: You love red velvet cupcakes but your favorite color is blue. Why not make blue velvet instead? Now you can have your two favorites in one. Happy baking! 1. In a small bowl, mix together the milk, buttermilk, and baking soda. Set aside. 2. In a large mixing bowl, beat butter and sugar using electric mixer until light and fluffy, around 5 minutes. Beat in eggs one at a time until just blended. 3. 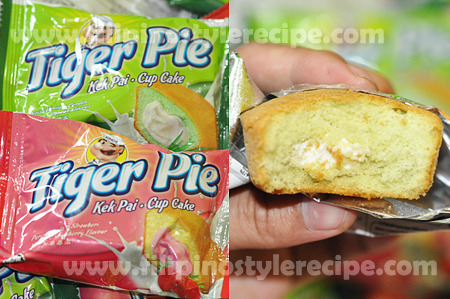 Mix in buttermilk mixture, food color and vanilla. 4. In another bowl, combine flour cocoa, powder and salt. Gradually blend dry mixture into the wet mixture. 1. Spoon batter into paper lined muffin cups until about 2/3 full. 2. Bake into preheated oven at 350 degrees for 15-20 minutes or until toothpick inserted comes out clean. 3. Remove from oven and cool in wire racks. 1. Beat the powdered whipped cream, water and food color until peaks form. Chill for 15 minutes.This will make the frosting easier to pipe and hold its shape. 2. Frost cooled cupcakes. Serve and enjoy. 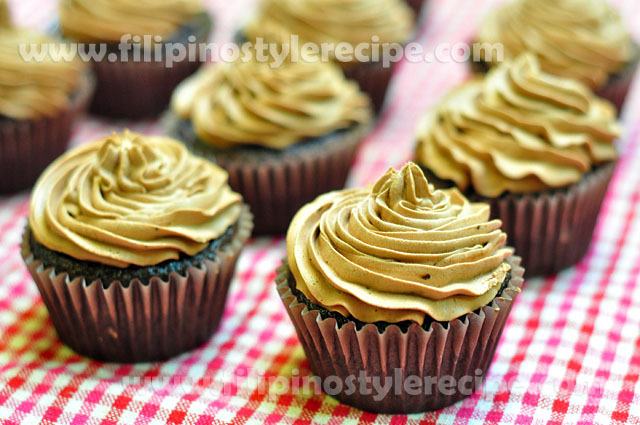 Filipino Style Recipe: Lemon Cupcake with Blackberry Frosting is another delicious pastry made of lemon flavored cupcake with blackberry frosting on top. 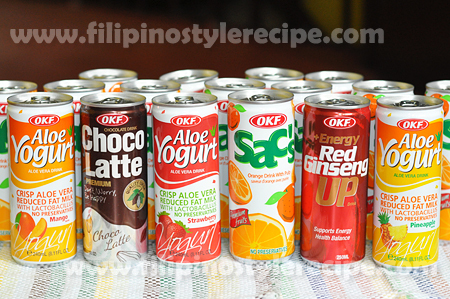 Best to serve with coffee or snack for kids. 1. In a mixing bowl, combine egg whites and cream of tartar and mix with hand mixer until stiff peaks form. Set aside. 2. Using a stand mixer, mix the butter, vegetable oil, and sugar until well combined, around 3 minutes. Add the egg yolks and vanilla until well blended. 3.Combine the flour, baking soda, baking powder and salt. Alternate adding the sour cream and dry ingredients in 3 parts in to the butter mixture until just blended.Do not overmix. Fold in the lemon zest, lemon juice, and egg whites to the batter until evenly combined. 4. Fill cupcake liners until 1/2 full and bake into preheated oven at 350 farenheit for 15 -18 minutes or until toothpick inserted at the middle of cupcake comes out clean. Remove from the oven and let it cool in rack. 1. Using a stand mixer, cream together the butter, powdered sugar, and salt starting in slow speed for about 2 minutes then at medium to high speed until light and fluffy. 2. Add the cream cheese 1 slice at a time while continuously mixing. Add the blackberry jam and vanilla then mix until the berries are blended. 3. Pipe or simply scoop out the frosting on top of each cupcake. Make sure that the cupcakes are cooled before frosting. Serve. 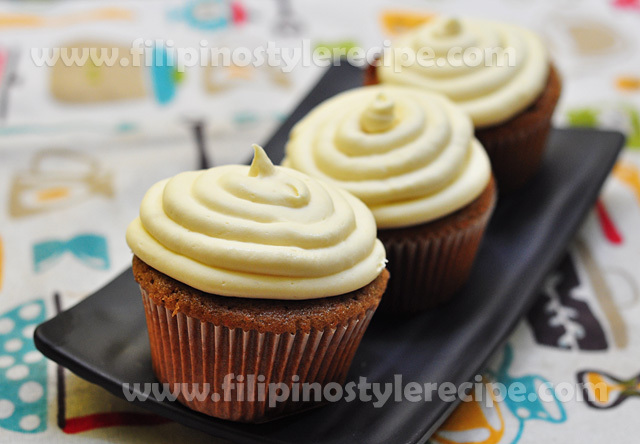 Filipino Style Recipe: Everybody is fond of red velvet cupcakes! And why not have other colors like brown velvet? 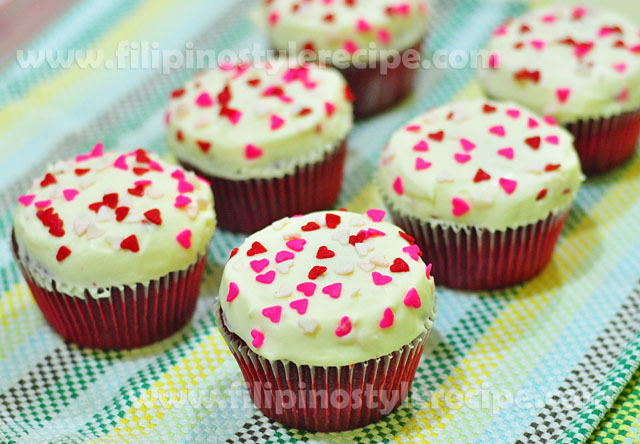 This cupcake is as soft and light as the red velvet with just a different color. 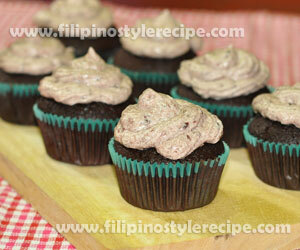 Plus, the blackberry cream cheese frosting is to die for! 1. Using a stand mixer bowl, combine the vegetable oil, eggs, vinegar, buttermilk, vanilla and sugar and beat until well blended. 2. In another bowl, combine the flour, baking soda, salt, and cocoa powder. Add the dry ingredients to the mixer in 3 parts and mix after adding each part, scrape the sides to make sure there are no left unmixed ingredients. Add the green and red food coloring and continuously mix until the colors are well blended. 3. Fill each cupcake liners 2/3 full of the batter and bake in preheated oven at 350 Fahrenheit for 23-25 minutes or until toothpick inserted at the middle of the cupcake comes out clean. 2. Add the cream cheese 1 slice at a time while continuously mixing. Add the blackberry jam and vanilla then mix until the berries are blended. Pipe or simply scoop out the frosting on top of each cupcake. Make sure that the cupcakes are cooled before frosting.